Kimi-Matias Raikkonen is a Finnish racing driver. After nine seasons racing in Formula One, in which he won the 2007 Formula One World Drivers' Championship, he competed in the World Rally Championship in 2010 and 2011. In 2012, he returned to Formula One, driving for Lotus and continues to drive for Lotus in 2013. Kimi Raikkonen started karting in 1987 and after several successes in the Finnish series moved up to compete at international level. His first steps into car racing were tentative – he made a few starts in Formula Renault UK in 1999 but fund his Mygale chassis uncompetitive and returned to karting. He returned to Britain to compete in the Formula Ford Festival and then won the Formula Renault Winter Series. That set him up for a return to Formula Renault with top team Manor. Team boss John Booth said: “Kimi had stayed in karts a long time, mainly because he couldn’t raise the money to get out of it until the Robertsons got involved.” Dave and Steve Robertson, father and son, managed Raikkonen’s career. Raikkonen and team mate Nick Heidfeld (who only had one season of F1 racing behind him) may have been an inexperienced partnership but both impressed. At the first round of the year Raikkonen finished sixth and Heidfeld fourth. Although Raikkonen failed to finish the next three races his maturity and speed impressed the other drivers and governing body and he was granted his superlicence. Heidfeld had reached Formula 1 via McLaren and Mercedes’ young driver schemes. At the end of 2001 with Mika Hakkinen on his way out of McLaren, Heidfeld was widely tipped to take his place. But it was Raikkonen, not Heidfeld, who got the coveted seat. Rumours insisted that Raikkonen had picked McLaren over Ferrari, as he did not want to be number two to Michael Schumacher at the Italian team. Ferrari boss Luca di Montezemolo played down the reports: “We are Ferrari, we are the reigning world champions and we would never put a young driver in such an important car.” Raikkonen eventually joined the team after a five-year stay at McLaren. In 2002 it was Raikkonen’s time at McLaren which brought mixed fortunes. The 2002 car, the MP4/17, could not compete with Ferrari’s dominant F2002, and reliability was problematic too. He finished third on his McLaren debut and made three more appearances on the podium. But had eight car failures in 17 starts. He ended the year sixth, 17 points behind team mate David Coulthard. But McLaren planned a radical approach for 2003: while the team would start the season with the updated MP4/17D, it would develop the radical new MP4/18. However the all-new car proved too radical and never raced. Meanwhile the MP4/17D was competitive and generally more reliable – with some exceptions. Raikkonen raced it to his maiden victory at Sepang and would have won at Interlagos as well had he held off Giancarlo Fisichella in the wet for one more lap. A likely win was lost to engine failure at the Nurburgring but Raikkonen also made crucial mistakes in qualifying at Catalunya and Montreal, which left him 20th on the grid for both races. Because of these problems (and a controversial late rules change that compromised McLaren tyre supplier Michelin and handed an advantage to Ferrari suppliers Bridgestone) Schumacher beat Raikkonen to the title by 93 points to 91, with six victories to Raikkonen’s one. The following year’s car based on the MP4/18 was a disaster – both unreliable and slow. A revised version of the car in the second half of the season allowed Raikkonen to take his sole win of the year – beating Schumacher at his traditional stomping ground of Spa-Francorchamps. He was joined at McLaren by Juan Pablo Montoya for 2005 and the team produced a car which was often untouchable. But it was also fragile, and although Raikkonen only retired from two races, several more were compromised by engine failures in qualifying that forced him to start further down the grid. Fernando Alonso beat him to the world championship, each winning seven races. But Raikkonen’s stirring win at Suzuka from 17th on the grid, passing Fisichella on the final lap, was the highlight of the year. McLaren solved the reliability problem in 2006 but lacked performance, failing to win a single race. Raikkonen had been in conversation with Ferrari about switching to the Italian team, and at Monza it was confirmed that he would take on one of the toughest challenges in F1 – replacing Schumacher at Ferrari. The season began brightly with a win for Raikkonen at Melbourne. But in the first half of the season it was clear team mate Felipe Massa had come to terms with the new 2007 tyres more quickly than Raikkonen, and it took until the eighth round at Magny-Cours for Raikkonen to add another win. From that point onwards Raikkonen reeled in championship leader Lewis Hamilton, who had replaced him at McLaren. Raikkonen set up a championship finale by winning at Shanghai while a strategic blunder put Hamilton out of the race. With Hamilton suffering a gearbox problem in the last round Massa (who had fallen out of contention for the championship) cleared Raikkonen’s way to win the race and the championship. Raikkonen’s world championship defence didn’t go well – to the surprise of many, he was beaten by team mate Massa, who took six wins to Raikkonen’s two. That hadn’t looked likely after the first four races, in which Raikkonen scored wins at Sepang and Barcelona. But a combination of poor qualifying performances, bad luck and occasional mistakes left Raikkonen playing a supporting role to Massa’s championship campaign by the end of the season. Hamilton took Raikkonen out of the race in Montreal. At Silverstone a bad pit call ruined a strong drive and an exhaust failure robbed Raikkonen of victory in France. But mistakes ruined his races at Monte-Carlo, Spa and Singapore, and on other occasions he struggled to get the F2008 dialled in. At the end of the season he came on strong, particularly at Spa and Shanghai, but the damage was already done. He salvaged third in the drivers’ championship, tied on points with Robert Kubica but having won one more race. Ferrari won just one race with the F60 in 2009 and that was thanks to Raikkonen, who claimed a fourth victory at Spa-Francorchamps. But it wasn’t enough to keep his place in the team. Despite having a contract for 2010, Raikkonen was bought out of his deal and Fernando Alonso arrived to take his place. After leaving the sport he drove in the World Rally Championship for Citroen in 2010. The following year he did a partial season of rallying and also made some appearances in NASCAR events, though not at the top level. Following the end of the 2011 season Renault announced Raikkonen would return to drive for them in 2012, when the team will be known as Lotus. Raikkonen’s return to Formula One was eagerely anticipated, though often expressed with questions about his motivation and commitment. The first sign wasn’t good: a mistake in qualifying in Australia saw him eliminated in Q1. But this was not the shape of things to come. Raikkonen finished every race and almost every lap, and brought his car home in the points at every race bar the Chinese Grand Prix, due to a strategy error. In the next race he came home second having pressed Sebastian Vettel for the lead at the midpoint of the race. On this occasion, as at Hungary later in the year, Raikkonen’s qualifying let him down. Too often his junior team mate Grosjean started in front of him, though Raikkonen outshone him in most other areas. A slice of good fortune helped him to an overdue comeback victory in Abu Dhabi, and he ended his first year back a creditable third in the world championship. Kimi married Jenni Dahlman in 2004 and they currently live in Switzerland. Jenni was a former Miss Scandinavia and a former top model. He loves and has competed in different kinds of motorsport events. In 2007 he competed in a snowmobile race in Finland and in 2008 it was announced that his face would appear on a set of Finnish postage stamps. Kimi is known for his apparent dislike to appear for media interviews and generally answers media questions in a blunt manner. 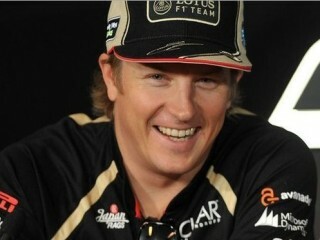 View the full website biography of Kimi Raikkonen.